A correspondent wrote suggesting that he had seen online NEC patterns showing a 30″ square small untuned loop to have a gain of around 10dBi, more than 30dB better than given by Calculate small loop Antenna Factor. Firstly, lets describe a loop for study, a square diamond with sides of 760mm (30″) of 2mm diameter copper fed in one corner at 7.1MHz. 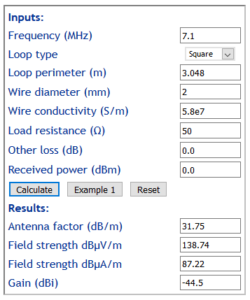 Calculate small loop Antenna Factor models a small loop in free space (therefore does not include ground losses). 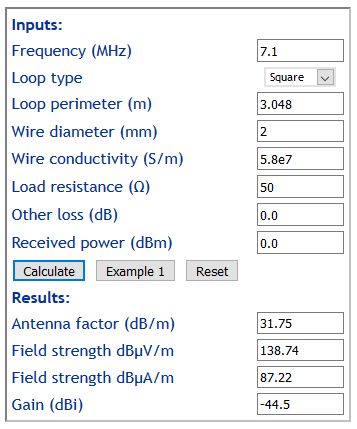 Above is the calculator result, the key figures are Antenna Factor 31.75dB and Gain -44.5dBi. An NEC-4.2 model was constructed with external excitation (1V/m) incident on the loop which has a 50+j0Ω load inserted at the feed point to represent the receiver load. Here is the model source. CM Note: rotations might not work properly in various NEC-2 versions, beware of segment size issues in NEC-2. The key result to be extracted from the model run is the current in the 50Ω resistor in segment 1 of wire 1. The magnitude of the current is 5.1204E-04, so the voltage developed in the resistor V=5.1074-04*50=0.02554V. Antenna Factor is the ratio of the E field excitation to the terminal voltage of the receiver, so in dB it is 20*log(1/0.02554) =31.83 dB/m. The NEC model’s 31.83 dB/m is close to the calculator prediction of 31.75dB/m, but includes the benefit of the lossy ground reflection . Likewise, Gain calculated from the NEC Antenna Factor of 31.83 dB/m is -44.6 dB, about a tenth of a dB of the original calculator prediction. Of course, transmission line loss to receiver needs to be factored in separately. Within the stated limits of the models, valid models should provide consistent results, and they do in this case. Results should be validated by measurement, and whilst I have not measured this particular loop, I have validated a slightly smaller loop (600mm square) that I use regularly for field strength measurement and so have confidence in the modelling tools for this application. My correspondent’s report of a 30″ square untuned loop with gain of -10dBi on 7MHz suggests a misunderstanding or the online expert’s model is seriously flawed. It is common that extravagant claims are made of small loops by would be aficionados, be wary.